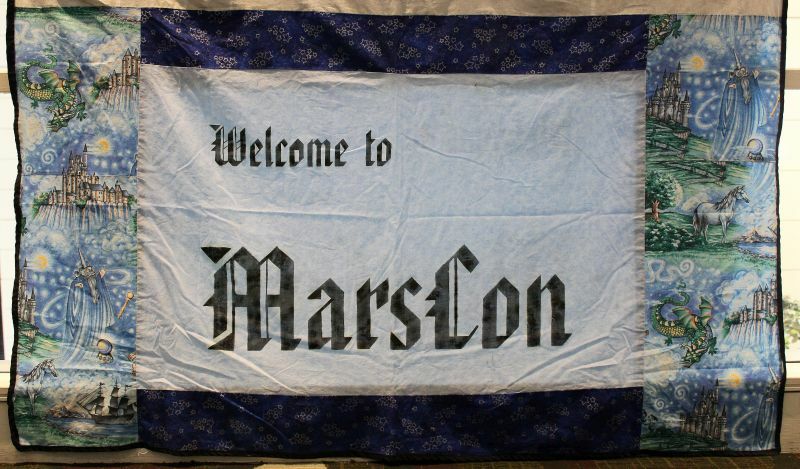 One of the MarsCon quilted banners welcomes attendees to the 20th annual convention. From my perspective, conventions are like buffets. There’s a large variety of things to do, and the best way to try it all is to do a little of everything. Also, if possible, do everything without needing to repark. It’s a strategy that served me well for MarsCon 2018, which also happened to be the 20th year of the con. For the most part, the weekend was pretty fun, though there are some issues with the convention that need to be addressed. 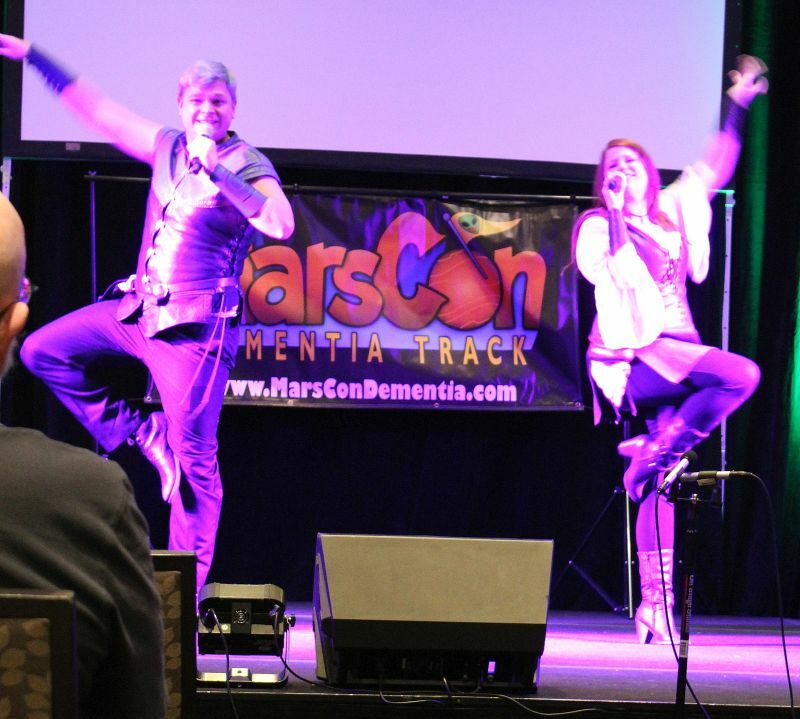 While MarsCon certainly isn’t the largest of the Twin Cities sci-fi conventions, having 876 attendees this year (compared to the 6,000-plus CONvergence has been drawing the past few years), it manages to offer a variety of activities and experiences, including the Dementia Music Track—something unique among the Minneapolis–St. Paul area conventions. And when you consider the attendance numbers compared with the range of activities available, it’s a good sweet spot to be in: there’s lots to do without being overwhelmed by the crush of people. While the con chair can change every year, the convention recognizes that planning can always be subverted by reality and embraces the idea of Eris, the ancient Greek goddess of strife and chaos (and sister of Ares, otherwise known as Mars). This ends up being both good and bad, as it allows the convention to easily deal with the random mishaps but can also give the impression that the larger things are dismissed as nonissues. 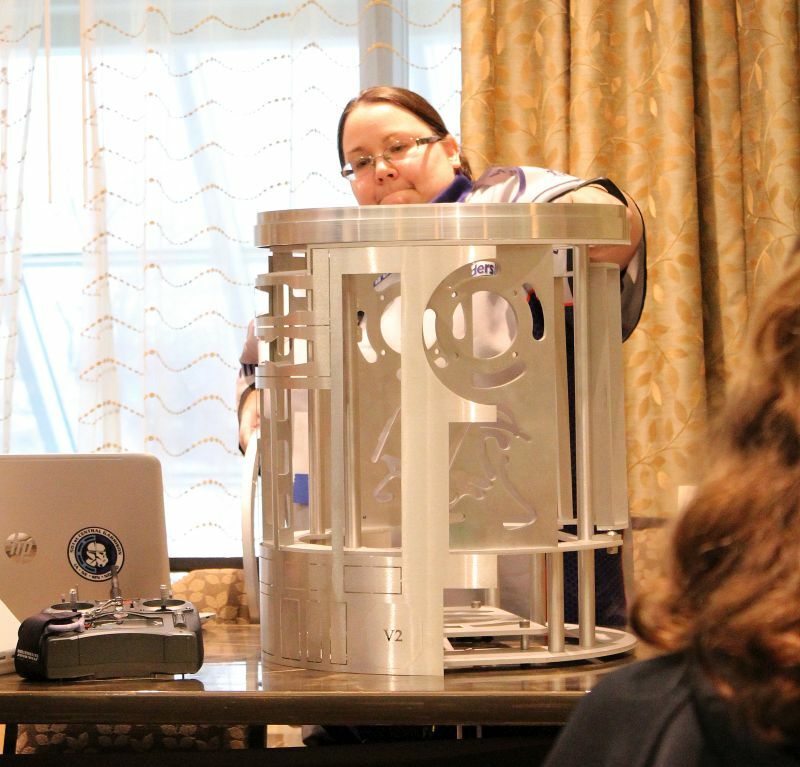 A droid builder shows off the body frame for her next R2D2. I found the droid-building panel, where a few droid builders shared their experiences creating their own R2D2s, incredibly fascinating. And in the costuming panel I attended, I was able to get information on a good source for non-Dritz eyelets and grommets. There were many more panels I wished I could have attended, but wasn’t able to fit them into my weekend, which I think is a good problem for a convention to have. 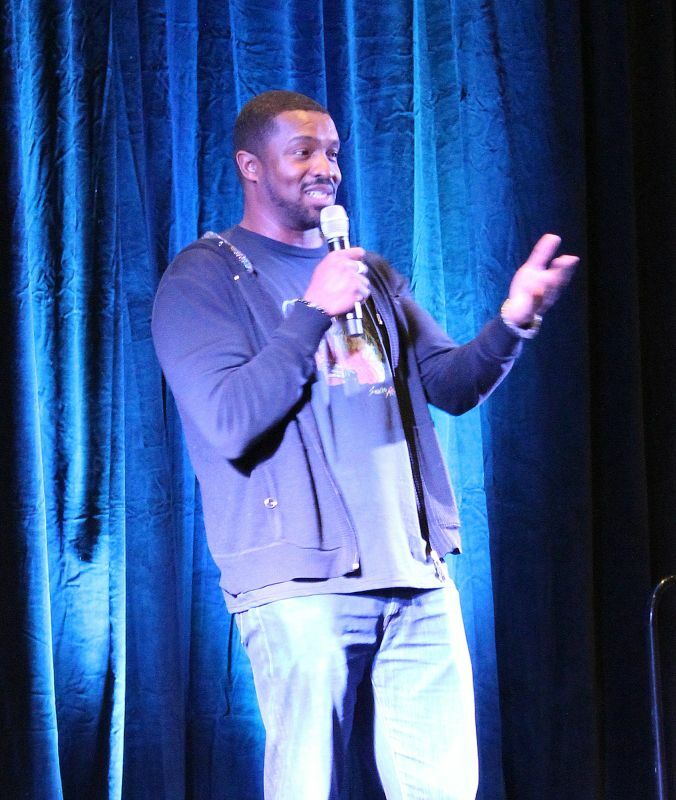 Actor guest of honor Roger Cross answers audience questions and shares anecdotes about his experiences on various sets. The room party I’ve helped with for a while celebrated its 10th year in existence with a singalong and special toast, and while the party floor felt much emptier than usual on both Friday and Saturday, individual parties still seemed well attended. The Anime Fusion party ran out of grilled cheese, and when I stopped in the Harry Potter party, it was standing room only. The programming on MarsCon’s mainstage is extensive enough to be a con unto itself. As I lack a Time-Turner, I wasn’t able to make it to everything, but I enjoyed what I did see. The Library Bards were back for the second year, and they performed their nerdy versions of pop songs with charismatic precision. Music guest of honor brentalfloss (Brent Black) brought a fun late-night show on Friday night—not the usual time for a guest of honor performance, but his show was best enjoyed after the kiddies were in bed. The great Luke Ski’s performance included a particularly heartfelt version of “Candybars,” a song that has been his most recent hit as played on the Dr. Demento Show. As always, the science room was full of models, information, and scientific experiences. 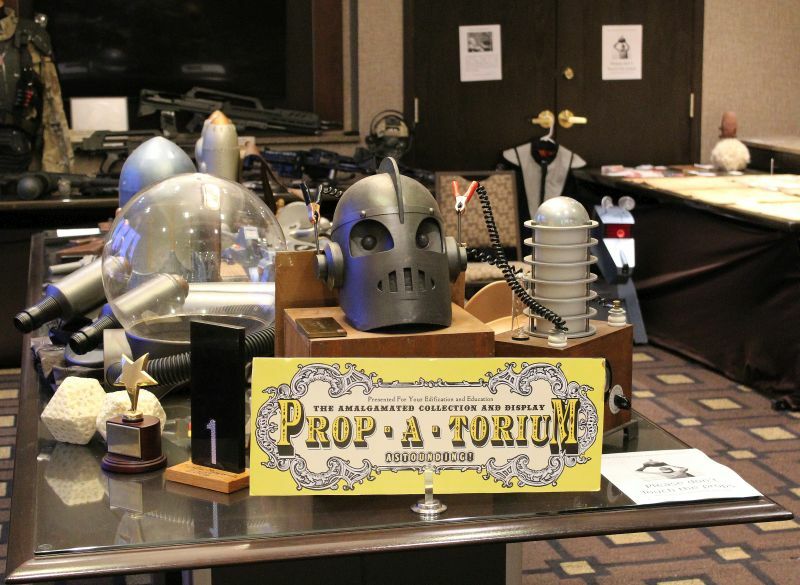 The Prop-a-Torium set up a great display of movie and replica props. The art show had another wonderful collection of artists (though I’m biased—my stuff was in there too), while the artist guest of honor, Steve Thomas, who created the wonderfully retrofuturistic convention art for the year, sold posters of his art at the dealers room. I may have gone home with four. The Prop-a-Torium all set up and ready for visitors. The airport/Mall of America Hilton, which has been the site of this convention for the past few years, does try—but it really seems inadequate for some of the event’s needs. I arrived a little before 1:00 p.m. on Friday afternoon so I could get checked in to the art show and start help setting up the room party, and the parking lot was already much fuller at that point than it had been in years past. I’m lucky I made an effort to get there when I did, as by 5:30, both the hotel and overflow lots were beyond full. Parking has been a problem in past years, but it was made especially bad this time by the weather. The number of spaces available was reduced, partly because the hotel sells a “stay, park, and ride” package for people flying out of the Minneapolis–St. Paul airport and inclement weather on the East Coast had delayed the return of many cars’ owners, which meant a significant number of spaces were occupied. The available spaces were further reduced by snow pileup, and the overflow lot also quickly filled up. All of this led the hotel to tell guests that people staying overnight should park in the parking lot of the nearby Embassy Suites, which is close as the bird flies but requires a walk of approximately half a mile. Not too bad for some day attendees, but problematic attendees with certain physical challenges and potentially difficult for anyone in the winter, especially if you’re toting luggage after dark. Here in the north, a sauna can be a nice hotel amenity. However, that doesn’t hold true if the sauna is actually your sleeping room. The first night involved very little sleep for me due to the temperature of our room. We were later able to get a fan from the hotel, which made for a much better chance of sleep for the second night, but this has been a problem for as long as the convention has been at this hotel. Of all the problems, this is the largest. In a perfect world, we wouldn’t need to spell out the behaviors that are and aren’t appropriate for a convention. The problem is, we live in an imperfect world, and MarsCon has experienced a number of problems over the past few years that have caused con goers, both those directly involved and those hearing about events after, to wonder whether this is a place that will let them feel safe. For example, at the masquerade in 2016, the emcee made a number of extremely inappropriate remarks about entrants while he was onstage. He later seemed unapologetic and apparently failed to see why unwanted sexual remarks were a big deal. This made a number of people very publicly upset, and understandably so. The reason this is still a problem two years later is because there was never really a public statement from the convention stating how this particular problem would be solved. Did the convention committee do anything? What’s in place to prevent it happening again? Yes, the concom theoretically changes from year to year, but a change in who’s in charge doesn’t erase the memories of the people who were concerned about an incident. This is more or less how the resolution has played out for each of the various public issues. Word about these issues spreads around the geek communities, and if the resolutions aren’t public, it seems like a lot of inaction on the convention’s part, whether or not something has been done behind the scenes. As a result, I’m hearing more and more people wonder if this is a convention they should stop attending. And this is where the code of conduct comes in. Yes, there is a code, but it is a little vague. Many of the codes of conduct for other area conventions go into detail about the types of things that constitute harassment and then go on to specifically state who is held to the policies. I wish that the MarsCon code would be updated with more detail and be more available—it should be posted and detailed at badge pickup and/or online registration, and reminders about the code should be more present around the con itself. Last year, in response to feedback, MarsCon added accessible seating and outlined the convention’s disability policy on its website as well as having it available in the convention booklet. This year, the policy wasn’t available on the website, nor did I see any accessible seating reserved. The policy was stated in the booklet, but to my knowledge, that was the only place the information was available. Personally, I’m of the feeling that we should make conventions easier for more people to attend, not harder, and consistency helps. While, again, the concom does change from year to year, it would be helpful if MarsCon’s parent organization, FenSF, included accessibility as a part of the convention that should be considered every year. I’ll always have a place of nostalgia for MarsCon. It was my first convention, back in 2007, and it didn’t take very long to figure out that I needed to be back the following year. Since then, I’ve attended every year except two (sometimes real life gets in the way), and it’s been a source of good memories and fun. However, personal nostalgia isn’t a reason to look the other way when things aren’t going as well as they could. If the site of the convention causes the same problems year after year, then maybe it’s time to look for a new venue. If attendees feel that issues from the past haven’t been resolved, perhaps it’s time to listen to the various people who have offered to help revamp policies and take them up on their offers. Personally, I hope the convention is able to solve and move past these major issues, because I’d like to see the con last at least another 20 years. If they can’t solve them, well, any future convention anniversaries may happen without me. Many thanks to Justin Grays and Hal Bichel for their assistance in writing this article. You can find Justin’s post about MarsCon 2018 on his website. I really enjoyed reading this article. I have never been to MarsCon before and I was debating going this year, but ended up not attending. The parking would be my biggest problem because parking is stressful for me especially if I have to fight for a spot. there is the option of taking the light rail/bus to the MOA, and then riding to the hotel via the hotel shuttle bus. there is also a light rail stop at the base of the hill (but the walk up to the hotel is a bit long). Very balanced article, and I agree with the author on all points. I have attended every Marscon since #2 as a Dealer and as a participant. I have been discussing the problems with the hotel with concom members ever since they went to the Airport Hilton. I am friends with many on both concom and FenSF, so I do have a bit of their ears, though those ears have unfortunately been deaf to this point. Marscon seems to have the attitude that they MUST be on the 1st weekend in March, and MUST be in Bloomington, which drastically limits their options. I don’t know if they wish to stay in Bloomington has to do with their proximity to the airport (for the ease of picking up & dropping off GOHs), or if there are other reasons. I was just vending at Paganicon, which this year had attendance commensurate with Marscon. They will be moving next year to the Crowne Plaza in Plymouth. The function space is quite adequate, though I don’t know what their parking situation is, nor how many guest rooms are available. I think it would be worth it for Marscon to at least explore this option. Unfortunately, Marscon locked itself into a contract with the Airport Hilton for another two years. Our parking and HVAC problems aren’t likely to be overcome. At least they kept the elevators working this year! Hey, Luke Ski here, chair of the comedy music track (The MarsCon Dementia Track named for former Guest of Honor Dr. Demento). 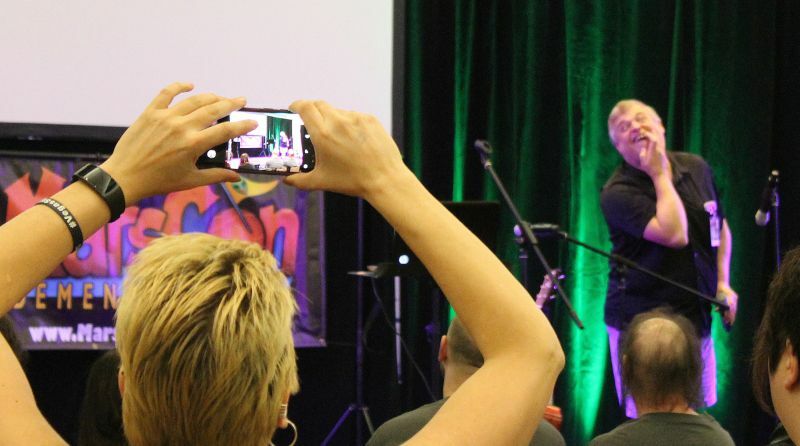 Since I have always lived far out of town (Madison, Chicago, and now Burbank, CA), my involvement with MarsCon has always been a distant one of me having tunnel-vision, concentrating just on my funny music track. The reason the MDT came into existence somewhere between 2003~2005 is because, unlike dozens of other conventions I had performed at that rejected the kind of entertainment I was trying to provide to modern con audiences, the rotating staff of MarsCon embraced it with open arms and allowed it to grow and flourish in the decade and a half since. Some of our recurring far-traveling fans call it ‘Mars-Mas’ (ala Christmas), and we all call it a family reunion. I’m very happy you enjoyed what you got to see of the track this year, and thanks so much for the compliment on my show. Last year, I invited the security staff up on stage during the Friday night set to let people know what to do if they have a problem, and how to contact the Safety Team. I even gave people my cell number as a double-precaution. I want MarsCon to be safe, fun, and accessable to everyone. There’s not much I can do from out here in La-La-Land during the rest of the year, but when I am there during the con running my personal 3-ring-circus of musical insanity, I am dedicated to keeping an eye out and being there to call the safety team to put a stop to anything that shouldn’t be happening.